M.A.Z.E. is a student project done at the ENJMIN, the national french school of video games. 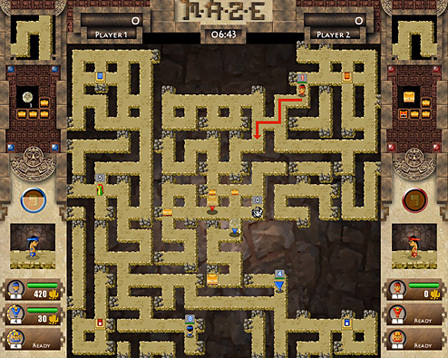 In that game, two players have to build a maze by placing tiles on the map, following certain rules. They also have some elements that need to be added to the maze: 3 heroes, monsters and treasures. The heroes are attracted to treasures and will automatically win against monsters on their path if they have leveled up enough. 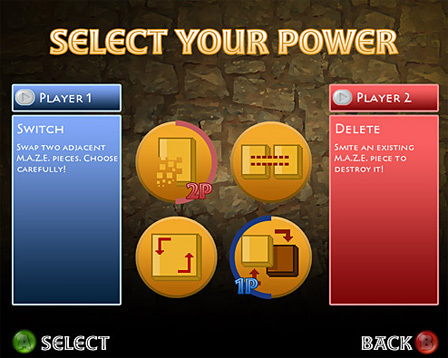 With these simple rules, the players will have to decide whether they use monsters to level up or to annoy the opponent for instance.